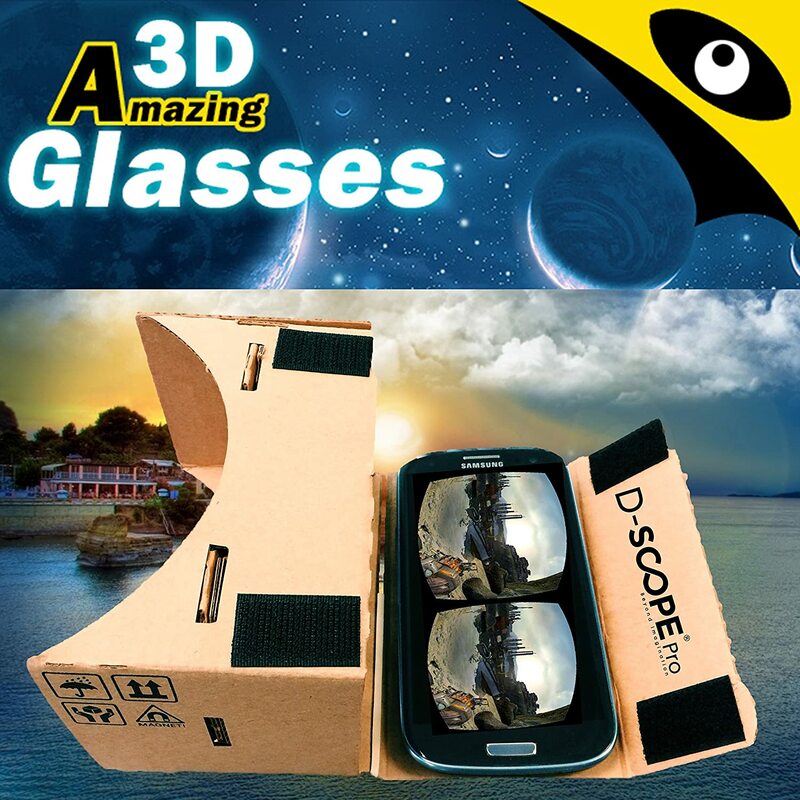 “The D Scope Pro Cardboard Kit will transform your Android or Apple smartphone into a 3D virtual reality experience.” Are you feeling a little cynical towards this statement? If you are be sure that others share your distrust and pessimism. And for all the skeptics I hear you loud and clear. Yes, it is a VR headset that is made of (ahem) cardboard, hence the $17 price tag. And yes, the 3D virtual reality images are provided via your own smartphone screen. So why is this cardboard kit (in particular) getting such good reviews? To put it plainly, it’s an awesome product that works as advertised. It’s also incredibly affordable offering higher quality far beyond its price tag. What is the D Scope Pro? First let’s discuss what exactly the D Scope is. As you can see in the image above the headset is made entirely of cardboard except for the two biconvex lenses that offer a 45 mm adjustable focal length for lifelike hi-def images. You then slide your smartphone into the headset and your phone is what displays the images. Upon receiving your kit and opening it you will notice that the cardboard comes in precisely cut and clearly numbered parts, allowing you to assemble the D Scope kit in a few minutes. After your headset is pieced together download the Google Cardboard app. Each unit comes with included QR codes which give you a variety of VR experiences to choose from. There are dozens of options including games and scenic tours. The D Scope Pro does not come with a head strap so you will have to hold the goggles up to your face manually. I ordered a cheap headstrap separately after I received my D Scope because I got tired of holding it. Check out either the Andoer or Docoller adjustable head mount straps. Both are identical and under $5. The google cardboard kit is a one-size-fits-all headset, which means that it will not fit everyone. It does have a large opening for your face that is meant to accommodate those like myself who wear glasses. My headset fits fine but those with larger glasses may have an issue. The big thing that I would caution people about is what phone you use. The D Scope kit says that it is compatible with: Nexus 4 & 5, Moto X, Galaxy S4, S5, & S6, HTC One, Moto G, iPhone 5, 5C,5S, & 6. However, the product description says that the headset will fit no larger than a phone with these dimensions: 5″L x 2.5″W x 0.5″ thick. I have an iPhone 6 which is slightly larger than these dimensions, and it fits and works fine. Just be wary. If you have a protective case you will most likely need to remove it before placing it in the D Scope headset. The best place to buy this google cardboard kit is on Amazon. There you will find the cheapest price at $16.99. If you happen to have Amazon Prime you can get free shipping as well. Google backs up this product with their own 100% money back guarantee if you are not completely satisfied. Virtual reality headsets are going to be big sellers this year. But is everyone going to be willing to shell out hundreds of dollars to experience them? The answer is no. Just like I was skeptic about the D Scope because of its appearance, I’m a little cautious of the upcoming wave of virtual reality technology about to hit the market due to the technology’s infancy. Like any new technology there is a chance that it is a short lived fad that comes and goes. And if it is technology that is here to stay there will most likely be many iterations and updates in the near future that will try to perfect it. Nothing new premieres without its faults. This product meets two needs. The first is that it’s a great introductory device for a virtual reality experience. If you’re like me you will be amazed at what a simple cardboard box and a smartphone app can do. And second is that it is affordable. My niece and nephew love to play with it. My D Scope Pro is beginning to show some wear and tear, but at $17 who cares. When it breaks I’ll just get another one. My hat goes off to Google. This is a fine product that anyone can enjoy.